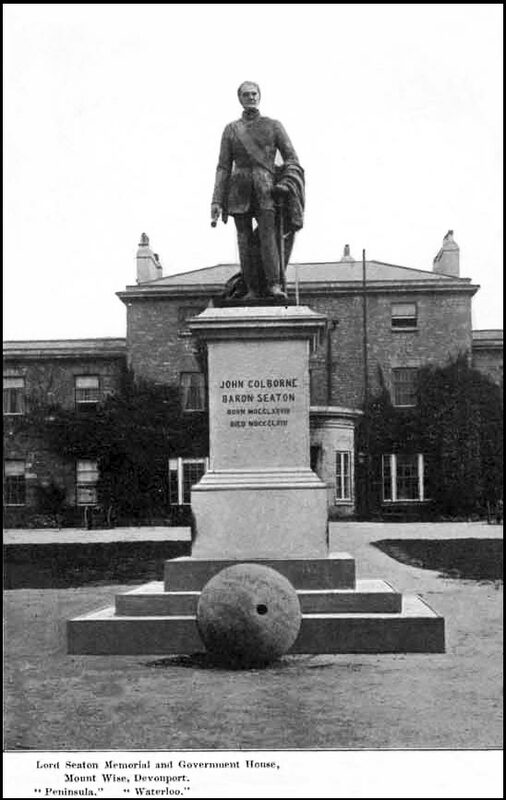 In November 1866 an 8 foot bronze statue of John Colborne, Field Marshal Lord Seaton, was unveiled in Devonport. Two weeks later an article describing the ceremony was printed in The Illustrated London News, together with a sketch of the statue. Both the article and the sketch are reproduced below. Sketch of Lord Seaton's statue as printed in The Illustrated London News, December 1866. The original site of Lord Seaton's statue was a few yards east of the high hill at Mount Wise, that which we we currently (at 2011) know as The Redoubt. The exact spot appears to be where Seymour House currently stands; this is ascertained from early 20th century postcards, such as the one shown below. Early 20th century postcard of Mount Wise. The statue of Lord Seaton is in the distance, very small. It's on the hilltop to the right of The Redoubt, on the plot where Seymour House was later built. The statue faced east. 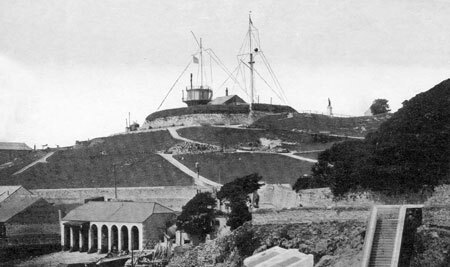 If you were stood underneath it then, looking east, your direct line of sight would be to the Parade ground in front of Government House, since renamed Admiralty House, but if you were to stand on the same spot today you'd probably be stood in the garden of Seymour House, unable to see Admiralty House because of trees and bushes. The ceremony of unveiling the statue of the late Field Marshall Lord Seaton, at Devonport, took place om the 29th ult. The weather was fine, and there was a a considerable attendance of ladies and gentlemen, including a number of military and naval officers. Among them were Earl Fortescue, Lord Clifford, General Sir A. Spencer, Port-Admiral Sir W.F. Martin, Admiral-Superintendent Drummond, Colonel Owen (Royal Engineers), and the commanding officers of the various military forces in garrison. The chairman of the presentation committee (Sir Edmund Prideaux, Bart.) opened the proceedings by referring in eulogistic terms to the many actions in which the late Lord Seaton had been engaged and to the various posts of responsibility he subsequently filled. This address was acknowledged in suitable terms by Colonel Colborne, the second son of the late Lord Seaton. 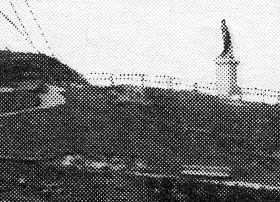 The statue, which is the work of Mr. G. Adams, and cast in bronze by Messrs. Elkington and Co., is fixed on a base of Cornish granite on the rising ground at the western boundary of Mount Wise. It is about 8ft. high, and faces the military parade nearly due east. Underneath is the inscription, "John Colborne, Baron Seaton, born 1778: died 1863." The western face has on it:- "In memory of the distinguished career and stainless character of Field Marshal Lord Seaton, G.C.B., G.C.M.G., G.C.H., this monument is erexted by his friends and comrades". On the north facing are the words "Canada and Ionian Islands," and on the south, "Peninsula and Waterloo." John Coolborne, Lord Seaton, G.C.B., G.C.H., G.C.M.G., K.M.T., Colonel of the 2nd Life Guards, a Field Marshal in the Army, was educated at Winchester, and was Lieutenant in the army in North Holland, in 1799. He was in Egypt in 1801; took part in the Battle of Maida, in 1805; and in that of Corunna, in 1809. He commanded a brigade in Sir Rowland Hill's division, in 1811; and at Cindad Rodrigo, although wounded in the shoulder, led the 52nd and won the ascent. Through this and other deeds of valour he was, in 1814, appointed Aide-de-Camp to the Prince Regent. At Waterloo Colonel Colborne forced the Old Guard to yield. For a time the General was Lieutanant-Governor of Guernsey. Between 1828 and 1836 he was Governor and Commander-in-chief of Canada, and secured the esteem and regard of the colonists. From April, 1843, to May, 1849, he was Lord High Commissioner of the Ionian Islands. His pension of £2000 a year is continued to his two successors to the peerage. He left six sons and two daughters. One son is a clergyman, three are soldiers; the eldest, the present Lord Seaton, is a Major on the half-pay list; the second is a Major in the 6th Foot and a Colonel in the Army; the third is a Captain in the 60th Rifles, and served at the siege of Sebastopol.
" In memory of the distinguished career and of the stainless character of Field-Marshal Lord Seaton, G.C.B., G.C.M.G., G.C.H., this monument is erected by his friends and comrades." Sir Edmund Prideaux, in his speech as Chairman of the Memorial Committee, said that to the end of his service Lord Seaton had maintained the same earnest, uncompromising zeal, the same self- devotedness, the same self-denying love of order, the same high chivalrous spirit, the simple, yet grand dignity which had characterized him everywhere. Sometime between WWI and WWII, possibly the early 1930s, the statue was moved 250 yards east and installed in front of Government House, on the spot which was previously a parade ground. Below is a postcard showing the structure in its new location; the date of the postcard is certainly pre 1934, since Government House was transferred to the Royal Navy in 1934 and renamed Admiralty House the following year. Pre-1934 postcard of the statue in front of Government House. Shortly after World War II, early 1960s according to one writer, the statue was moved once again, from Mount Wise to Seaton Barracks, Crownhill, where it stood for until the 1990s. When Seaton Barracks began closure operations during the 1990s the statue was removed to Winchester Army Museum, where it remains to this day. According to Chris Robinson the location of Winchester Army Museum was at the request of the Colborne family  . The Illustrated London News of 13 December 1866. From the book The Life of John Colborne, Field Marshal Lord Seaton, G.C.B., G.C.H., G.C.M.G., K.T.S., K.S.G., K.M.T., &c., By G.C. MOORE SMITH, M.A., London. Publisher, John Murray, Albemarle Street, W. 1903. Chris Robinson. Colborne Road Accessed 25 October 2011. Apologies but I didn't record where I saw this date given; I have a feeling it was in one of Brian Mosely's books.